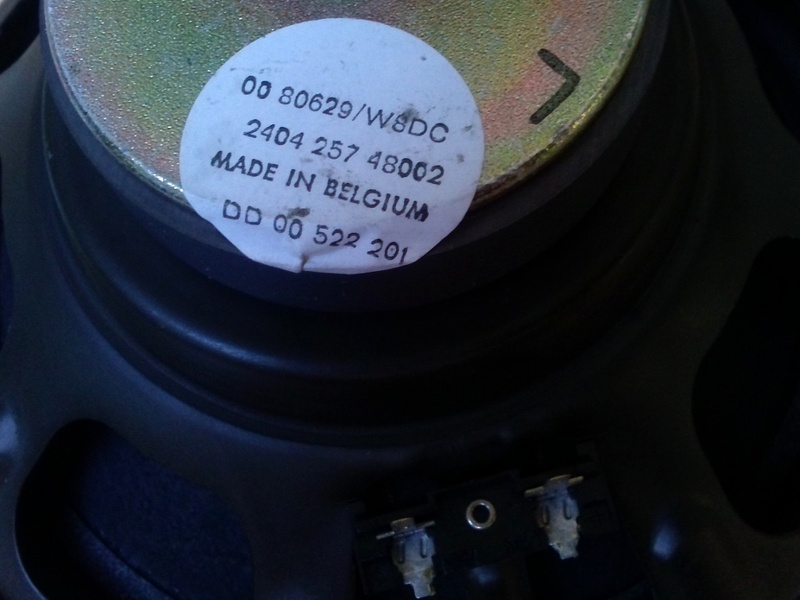 This page has some information on the Philips FB830, and shows how to refoam the surrounds of the woofer and mid (squawker as Philips called them). The Philips FB830 is the smallest in the second Philips FB800 Conductor series. 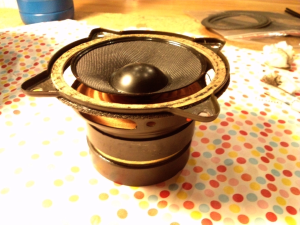 It is the follow up to the FB815 in the first FB800 conductor serie. It has the same drivers, but a different filter, and slightly different looks. 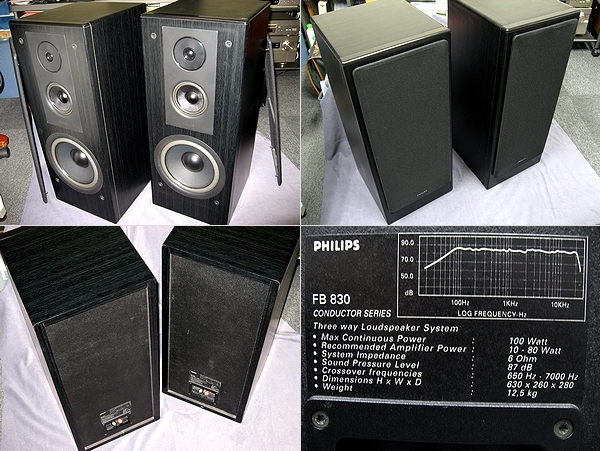 The Philips FB830 is a very balanced speaker. The high tones are clear, but not too sharp. The mids are detailed and clear, and especially the bass is well defined and very detailed, and performs really well in music that has lots of instruments playing simultaneously in the lower frequencies. 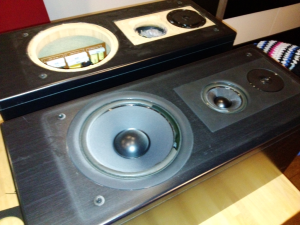 Compared to it's larger brothers such as the FB840 and FB850 the bass in the FB830 is better defined and more detailed, even though the FB840 and FB850 do play a few hertz lower according to their technical specs. Late 2014 I discovered that the foam surrounds of my pair of FB830's were breaking apart. 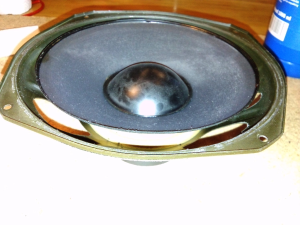 This is a known problem in the conductor series, and new foam surrounds can be retrieved from http://www.repairyourspeakers.com/. I created a few photo's, that became the start of this page. The drivers are placed in a 30mm MDF frontpanel, all other panels are 19mm MDF. The drivers are in separate chambers inside the speaker so they will not interfere with each other. First thing to do is to remove the plastic covers. If you have strong nails you should be able to pull them off with your hands. They are glued on a couple of points. 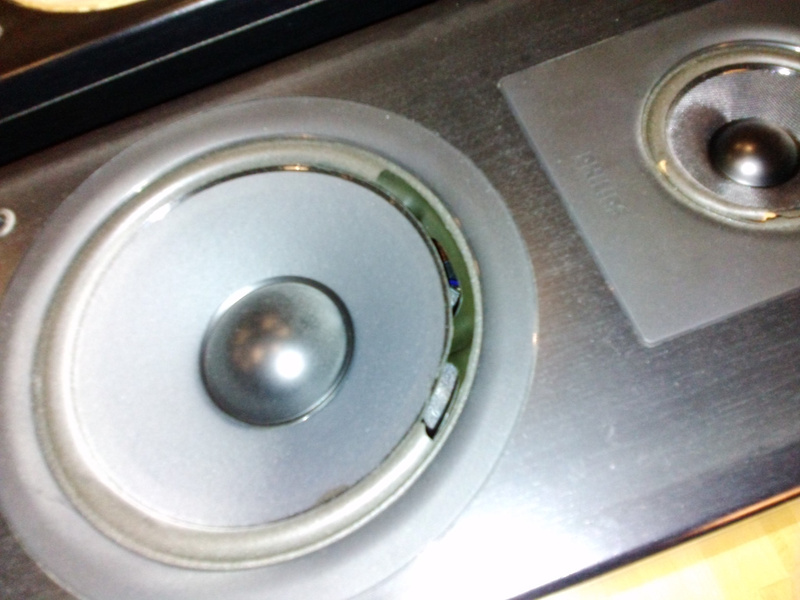 Then remove the speakers with a torx screwdriver. 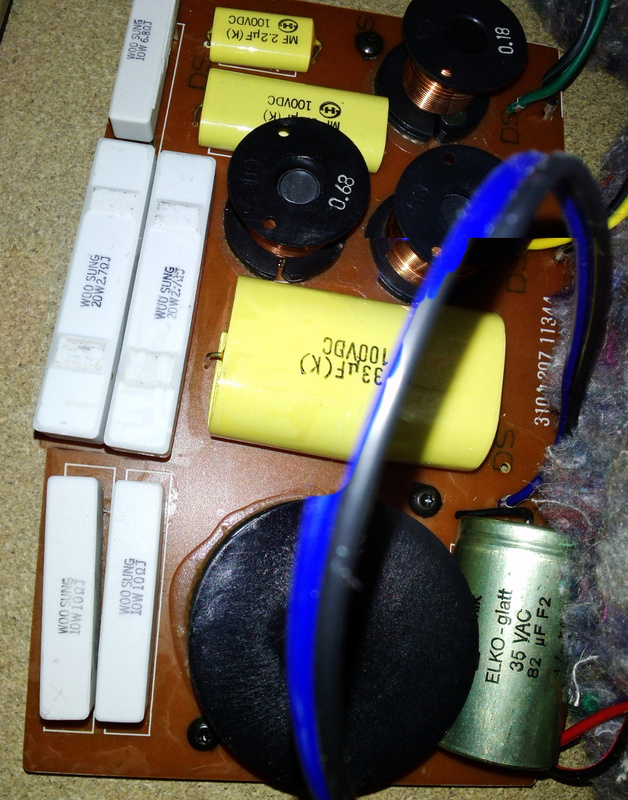 On the photo you can see the filter attached to the left side next to the woofer. Next step is to remove the foam surrounds. Start first by removing them physically. 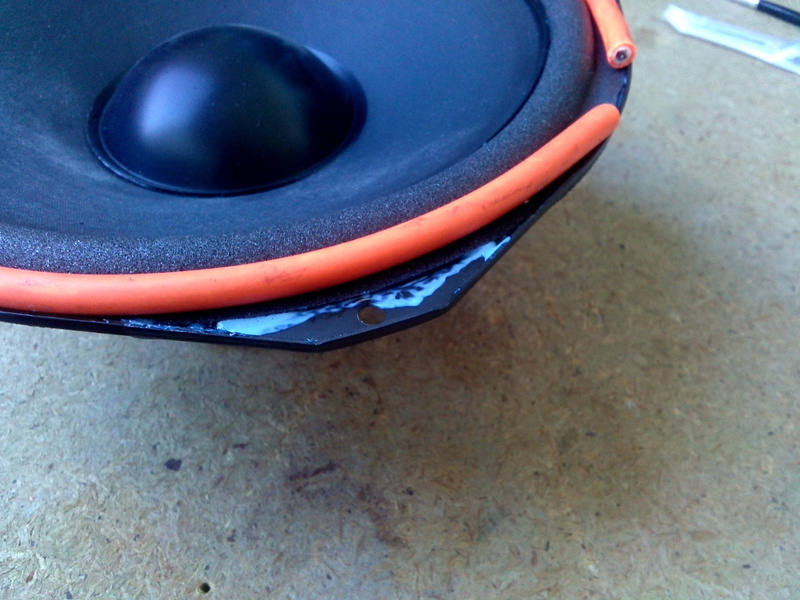 Take care that you don't damage the speaker. I used a small knife, but not to cut, but to "push" the old foam off. The old foam is very sticky, so you better put an old newspaper or so underneath. Next you start with alcohol. The foam dissolves in alcohol. Use a cloth with quite some alcohol, and put it on the foam remainders which will become soft. First you can use a knife to scrape the soft foam off, later you can use a cloth to get it off. The mids (squawkers) are easier to clean, they have some kind of plastic coating which makes it easier to use a lot of alcohol to dissolve the foam. The frame has a cork-like material, which is also easy to clean with lots of alcohol. Now everything is cleaned you can try the new foam rings. It is recommended to try them on without glue first, so you can see if they fit right. It's glue time! 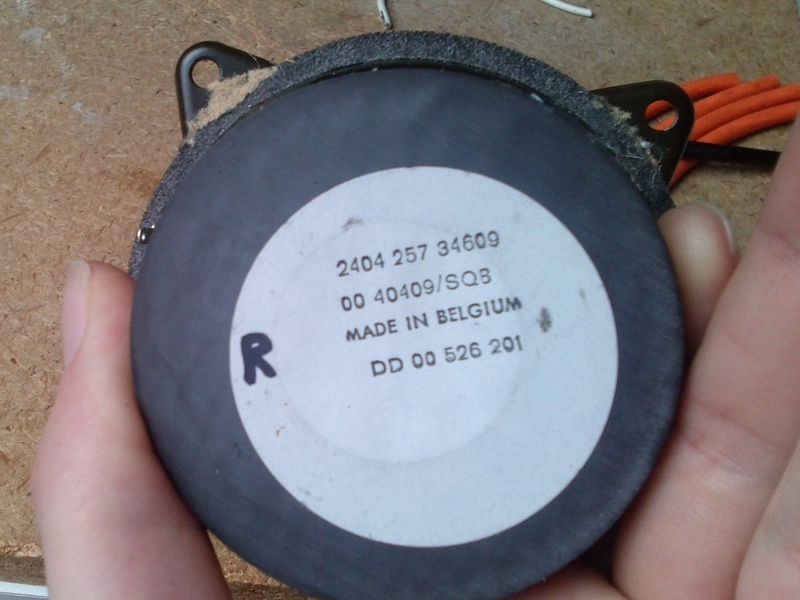 The glue from audiofriends is white, but dries transparent. I added a few drops of black ink to the glue, so it looks blue, but dries black. Since the rings are glued on the back of the speaker cone it's a bit tricky, but the specific audiofriends manual describes it well.. First glue on the foam ring, and then put the foam ring around the speaker cone. We did it with two persons which makes it much easier to get it on the right place without getting glue everywhere. Since the rings fit almost perfectly, it's not very hard to get them on the right spot. 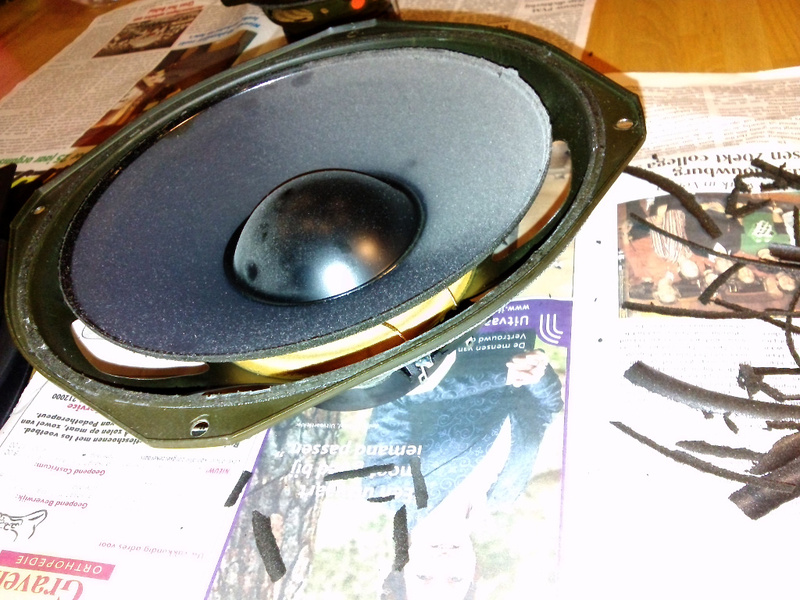 Next is the most tricky part of the work: glue the new foam surrounds to the frame, and center the cone correctly. I followed the audiofriends manual. 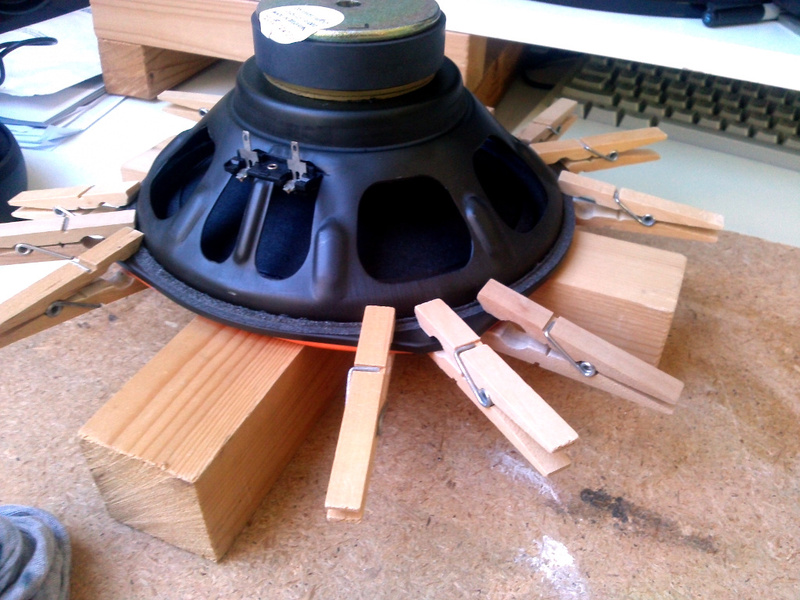 Put clamps on four corners, and test the cone alignment by pressing on all sides. Once satisfied, glue the bits in between. I put bits of thick round cable on top of the glue'ed surround, and placed the speaker upside down on those cable bits. 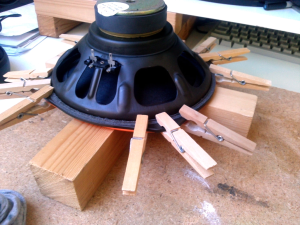 The weight of the speaker itself is now pressing the foam surround on the frame. After that you can glue the corners themselves. I shifted the pieces of cable to the corners, and placed them upside-down again. After finishing the woofers I tried to do the same with the mids. But the new foam surrounds stick already to the cork-like material of the frame without any glue, so I found it very hard to shift the foam surround when centering them. 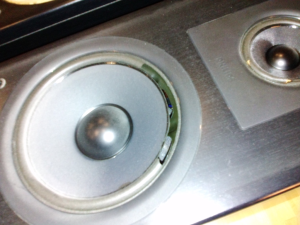 Just removing a clamp and pushing a bit was not enough to move the surround. After a while I decided to glue and center in one go: as long as the glue is fresh, it acts as lubricant and makes centering easier. But you have little time, you have maybe 5 or 10 minutes to get it perfect. 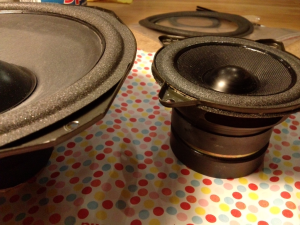 I created some new cable pieces, this time much thinner than the pieces I used for the woofers. 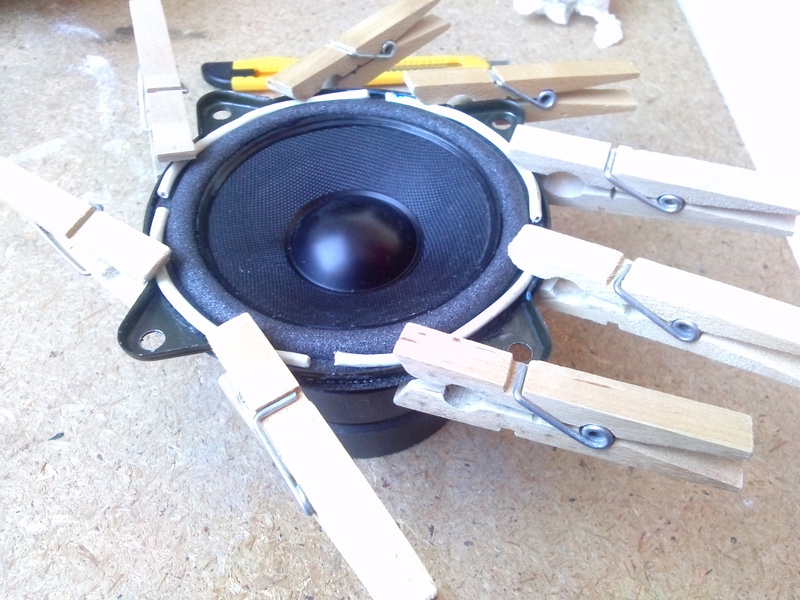 I couldn't place them upside-down with these pieces, so I added a few more clamps and pushed them by hand a few times. And the last bits are easy: wait a day for the glue to become really hard, place the drivers back into the box, and start playing. 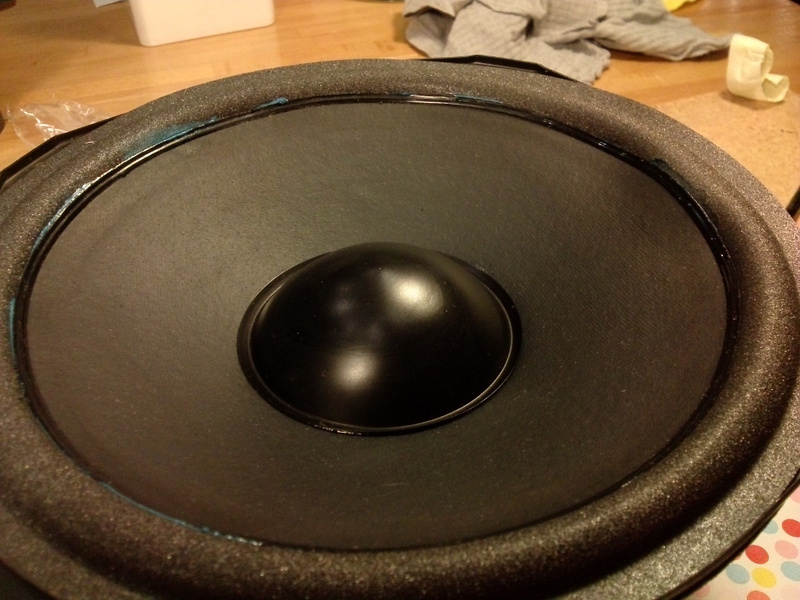 The first week the foam surrounds might be a little stiff, but the sound should improve after playing for a while.